The panel was a Law Society CPD certified presentation and included a discussion moderated by well known Personal Injury lawyer Rikin Morzaria of McLeish Orlando LLP. The discussion featured Rikin, Mike and Kris Bonn, managing partner of Bonn Law Office. They reviewed the cost, feasibility, and benefits of moving a law practice to the cloud. Rikin leveraged his firm’s experience as clients of LexCloud.ca to ask Mike pointed questions about deployment, support, costs, and functionality. Kris Bonn, who considered and rejected Cloud IT several years ago, described his evaluation process and questioned Mike about Internet connectivity, application compatibility, and costs for a firm to migrate to the cloud. Mike explained how the desire to work anywhere, the existence of cheaper and better Internet, and the security risks of doing it “the old way” lead to the rise of Cloud IT as the industry standard. In addition, he answered a range of questions about important features for law firms such as remote access, legal application compatibility, and the simplicity of the subscription model. Mike moved on to address Kris’s concerns on the costs of Cloud IT versus on-premises IT, at one point detailing the many piecemeal and surprise costs that arise in owning hardware on-site, while highlighting the “simple monthly fee” subscription approach of the cloud. 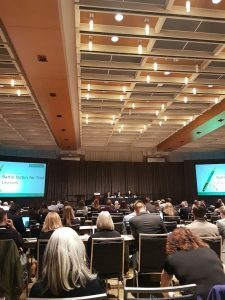 When the panel opened up to questions from the over 200 lawyers and law clerk delegates in attendance, the panelists fielded a range of questions from insurance requirements, to how the system handles closed matters. Overall, the audience appeared to be interested and engaged in the idea that Cloud IT could be the next step in the evolution of their firms’ IT.